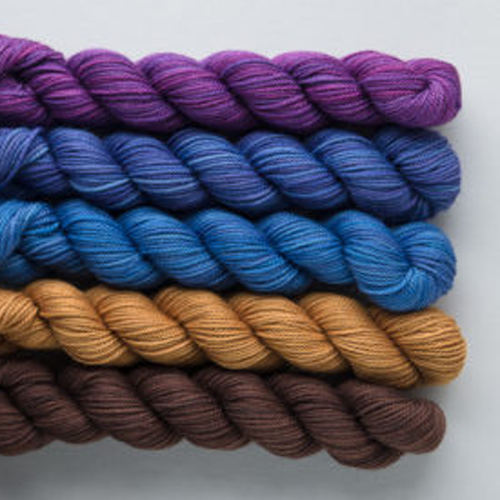 These cute mini skein sets are beautifully vibrant and fun. They're perfect for that little pop of colours. Knit these mini skeins into a striped shawl or a colour blocked cowl......ombre socks or a fair isle hat. The possibilities are endless. Each set contains 5 mini skeins of Tough Love Sock, each mini skein provides 96m (105yds), so that's a generous 480m (575 yds) in every pack. Tough Love Sock is the best-selling sock yarn from Sweet Georgia Yarns. It’s spun from 80% superwash, superfine merino and 20% nylon. This 3-ply yarn is so versatile - knit it firmly for hardwearing socks or loosely for drapey shawls and wraps. It’s the perfect blend of warmth and strength to stand up to your affection and abuse.